Great value in downtownsubmitted by Marjorie J. 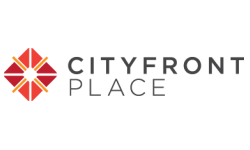 - Sep 01, 2015 |Recommended: YesI have enjoyed living at CityFront for the last year. The amenities are top notch, and the staff courtesy and prompt. The neighborhood is wonderful, walkable and safe. Closing to movies, bowling, great restaurants, and shopping. Looking forward to the Target opening up the block in October. Great place all around. Great amenities A nice place to live. submitted by Sean P. - Aug 26, 2015 |Recommended: YesThe location is very convenient for us Also, we really enjoy the grills on the eighth floor deck. The priority is the most cost-effective in the areasubmitted by Franklin B. - Aug 17, 2015 |Recommended: YesLiving here is an awesome experience because of the perfect location combined with all amenities one needs in the winter. City Front Place Apts.submitted by Susan K. - Aug 11, 2015 |Recommended: YesIt is a great place to live, right by the river with great views. Great Property, great staff both office and maintenance. Noise levels are very low. Excellent location and environmentsubmitted by Roberta P. - Jul 06, 2015 |Recommended: YesI really feel lucky to have come to Cityfront place. The amenities are great, the location is spectacular I get to watch Navy Pier's fireworks from my window twice a week during the summer and the maintenance staff is very reliable. Simply The Best Apartment Complex in Streetervillesubmitted by Sean E. - Jul 01, 2015 |Recommended: YesI've lived in a lot of buildings in a lot of different cities and CityFront Place is, by far, my favorite of them all. The friendly staff and well-maintained building just continue to impress me month after month. I love calling this place home. This is a wonderful place to live.submitted by Celina B. - Jun 23, 2015 |Recommended: YesEverything you need is in this building. Once you've lived here, you won't want to live anywhere else. Pleasant, well-constructed, enjoyable, friendly, clean, great location. submitted by Matthew R. - May 26, 2015 |Recommended: YesManagement takes good care of the building. The staff is extremely friendly. The amenities are good quality. The tenants are respectful. Parking is never an issue. Overall, this is a very enjoyable living experience. Great experience - City Front is a real gem submitted by Adam D. - May 22, 2015 |Recommended: YesI've been living at 400 N McClurg for 3.5 months now and my experience is nothing short of exceptional. The door staff is friendly and always welcoming to tenants - the maintenance and cleaning staff are always working hard to keep the building in great shape - and the building itself is a great place to come home to every night. I can't say enough about the perfect location and the surrounding area, it's a great time to live here and a great place to call home. I look forward to the continued updates and upgrades at 400 N McClurg. Reviewsubmitted by Kang W. - Apr 01, 2015 |Recommended: YesI love this community and people around are super friendly. The new online maintenance system and mail room system are very efficient and convenient. Also, I like each single doorman in our building. Of course, we have the best view in the city. Quick question, do we have any outdoor window cleaning coming up in spring? Thanks a lot! Appreciate all your services and works! I really like living heresubmitted by Nicole O. - Mar 31, 2015 |Recommended: YesI think this is one of the best locations to live. The building is nice, the apartments are great, spacious with amazing views. The front door staff is very nice. This is the best location bc it is so close to everything yet it can also be quiet when you need it to be. Love, Love, Love!submitted by Kim M. - Mar 23, 2015 |Recommended: YesFantastic building, friendly people, gorgeous views from every apartment. I have been here for 5 years now and wouldn t think of moving. Amazing River City Viewssubmitted by Stanton A. - Jan 29, 2015 |Recommended: YesIf you are looking for an apartment community with updated amenities with great views of the river and lake Cityfront is the place to live. The leasing staff is wonderful especially Matt, Laurie, Stephanie and John. They take care my every needs. DOGS: $500 non-refundable fee for one dog & 750 non-refundable fee for two dogs. 2 pet maximum - Pets upon approval. Breed Restrictions Apply. Call for details. CATS: $350 non-refundable fee for one cat & 500 non-refundable fee for two cats. 2 pet maximum - Pets upon approval. Breed Restrictions Apply. Call for details.